The Christmas drink and drug driving campaign Operation Holly, arrested 666 impaired drivers across Hampshire and the Thames Valley throughout the month of December (1st December 2018 to 1st January 2019). 275 people of those arrested for drink and drug driving offences were in Hampshire and the IOW. Compared to last year’s campaign, the average number of drink drive arrests has fallen by 5%, while the figure for drug drivers has increased on average by 28%. 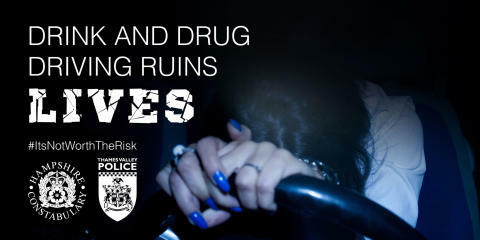 Do you know someone who drinks or takes drugs and drives? Call police on 101 or, if it’s an emergency, dial 999. If you don’t want to speak to police or give your name, call Crimestoppers anonymously on 0800 555 111. Over 4,200 breath tests were carried out during the Op Holly period by roads policing officers with 155 blowing over the drink drive limit. Over half of the 284 drivers tested for drugs had a positive result for drugs; 150 people who had a drug wipe test had a trace of drugs in their system. With a further, 26 arrested for failing a Field Impairment Test (FIT). The worst offending drink driving age group were 35-49 years; the highest number of drug drivers were aged 17-24.